The Pending Orders list tells you a lot more than just which orders are pending. It shows you the status of which work areas have been completed, if a proof has been sent out or if it was returned. It lets you view the job ticket, jump into time and materials entry, etc. Date In: This column has colors that correspond to the length of time since the order was received. The amount of time for each color group is a value you can edit under Printing->Setup. An explanation of these colors and what they mean is at the top of the report. Proof: This column will read "Out", "Revise" or "Ok" depending on the status of the proof. If there are no words in this column, it means there has been no proof sent or returned. T&M: Time and materials can be entered by clicking on the Time button. 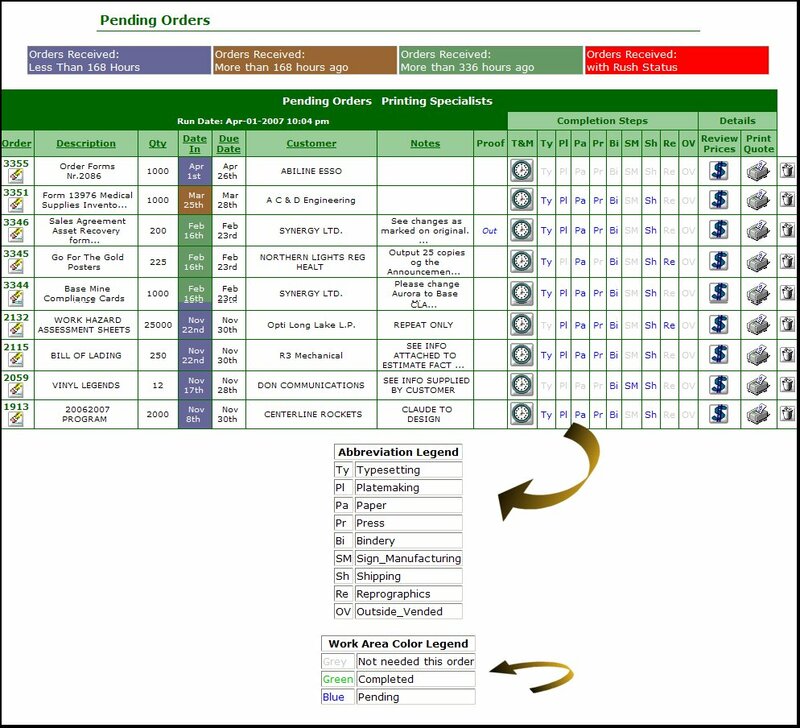 Completion Steps: Except for T&M, these are the work areas you have defined for your system. To see what the two-letter designations stand for, there is an explanation at the bottom of the screen, along with an explanation of what the various colors of the fill-ins mean (pending, complete, or if grey - not needed for this job). Print Quote: Click on the Print button to create a printed copy of a quote. Delete: Click on the Delete button to cancel a job. When you do this, you will have to enter an explanation as to why the job is being deleted, and who is doing the deletion.